From Broadway turn right heading west on PCH. 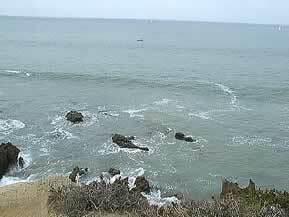 Corona Del Mar is several miles down PCH. 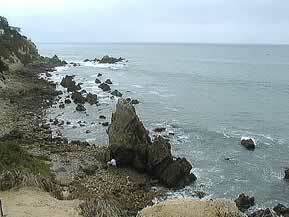 Corona Del Mar is past Laguna Beach and past Crystal Cove. 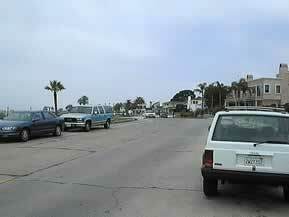 When you will find yourself going into an area where there are businesses along PCH you will be very close. Turn left at poppy street and follow it to ocean. Take ocean right (west) till you reach the grassy park area and decide if parking is available. These direction assume that you are coming from the Laguna Beach area (where you stopped off at the dive shop to say hi). If you are going directly to this beach it is more appropriate to exit the 73 freeway at MacArthur heading south. Continue till you reach Coast Highway and turn left. Turn right at Marguerite and continue till you reach ocean. Parking at Corona Del Mar has two options. Parking up on the street where you are closer to the diving, but the is more limited. There is also a "fee" parking lot that is large with plenty of spaces, but is a long hike across the sand to the diving area. In this picture you can see the parking lot in the upper center where the palm trees are. The picture is taken from the diving area. This is the distance that you will be walking in full scuba gear if you decide to park in the parking lot. 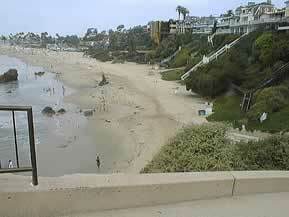 The Beach Access at Corona Del Mar Depends on where you parked. 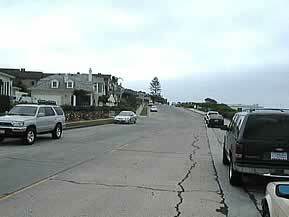 If you parked up on the street you will follow a steep paved pathway down to the beach. 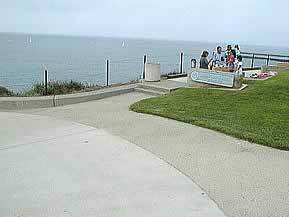 Here you see the pathway as it winds around and down to the beach. Use extreme caution when navigating this steep pathway with scuba gear on. If you parked in the parking lot you will be hiking east across the sand towards the rocks where you enter for diving. See picture above. Facilities at Corona Del Mar again depend on where you were able to park. When parking up on the street the only facilities available is a nice grassy area for changing into dive gear and trash cans. If you are parking in the parking lot there are bathrooms, rinse showers, telephones and fire pits. 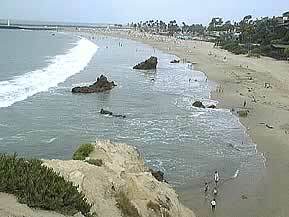 Diving at Corona Del Mar is primarily on the east side of the beach. On the east side there are tide pools up close to the cliff's and there are rocks scattered throughout the diving area. Lots of places to explore with different sized rocks and crack to find creatures. The diving in the area is relatively shallow, in the 8 to 20 foot deep range. This picture is further to the west, closer to the center of the cove than the above picture. Here you can see that the rocks are in an area is relatively shallow, again in the 8 to 20 foot deep range.